Grand Prix Stakes champion Gamdonguibada (Werblin) makes her 2nd appearance of 2013 as she heads the field in the feature race at Busan this Friday. The 4-year old filly should have too much quality for the likes of Viva Ace (Macho Uno) and Prince Kingdom (Roar Of The Tiger) in the 1900 metre handicap. which is the final race at Busan on Friday afternoon. At Seoul, the pick of the action is on Sunday. Tough Win (Yonaguska), the 2011 Grand Prix winner headlines the feature race – which is also the last of the day – in which he faces a couple of dangers, including the well handicapped Aussie up and comer Sydney Jewelry (Lion Heart) and the exceptionally poorly handicapped KRA Cup Classic winner Sing Sing Cat (D’Wildcat), but should come out on top. Earlier on Sunday, however, a horse who should eventually be meeting Tough Win will be on show. Feel So Good (Ft.Stockton) has won both his races in Korea since returning from a successful spell in the United States and will be the overwhelming favourite to continue his steady progression up the ranks as he faces class 3 opposition over 1800 metres in race 9. Ikuyasu Kurakane, who rode at Seoul and Busan for 2 years between 2007 and 2009 will return to Korea. 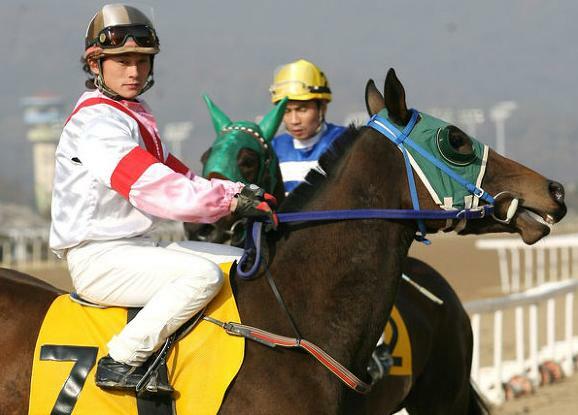 The 38-year-old jockey has been granted a 6 month license to ride at Seoul Race Park beginning from April 6. 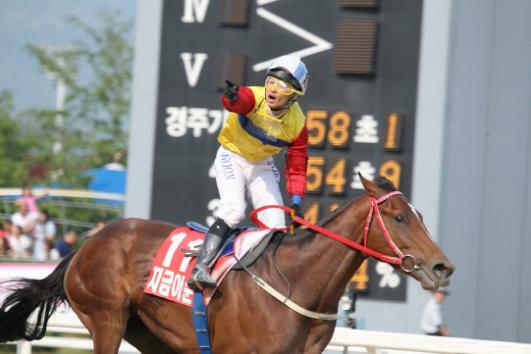 Along with countryman Nozomu Tomizawa, Ikuyasu joined the jockey ranks at Seoul in mid-2007 and quickly established himself among the top riders at the track, winning the NACF Chairman’s race on filly Pilseung Giwon (Silent Warrior), that autumn. 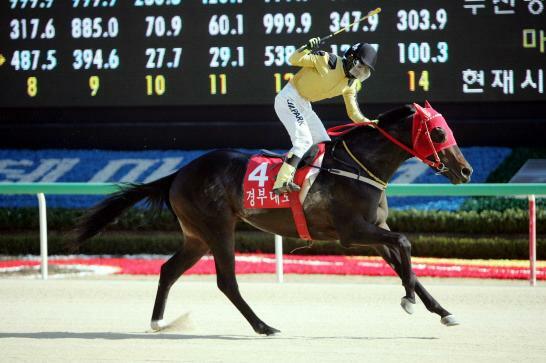 After 18 months at Seoul, he moved to Busan in late 2008 and continued to be successful there, ultimately notching a total 106 winners from just over 1000 rides in Korea. The jockey recently landed his 1500th career winner in Japan but had been looking for an opportunity to return to Korea for some time. He’ll join Yukio Abe at Seoul, who has had a quiet time since relocating from Busan last year but who recently extended his contract by another 4 months. At Busan, where foreign jockeys tend to have an easier time of things, Joe Fujii and Darryll Holland are the only 2 foreign riders. 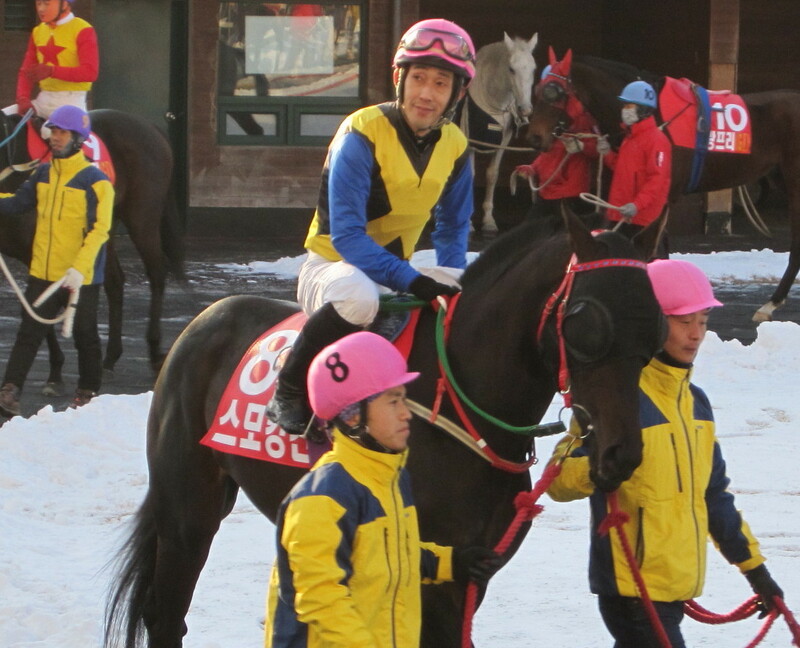 Ikuyasu was one of the few foreign riders who did not struggle in the past to get rides at Seoul. His return, coming as it does at the same time that champion jockey Moon Se Young arrives back in Korea from his 3-month stint in Macau, means things could be about to get very competitive in the capital’s weighing room. The 2013 Korean Triple Crown is about to begin but today punters were treated to stirring performances from two heroes of Classics gone by as Derby winners Ebony Storm and Jiguem I Sungan took out the feature races at Busan and Seoul. 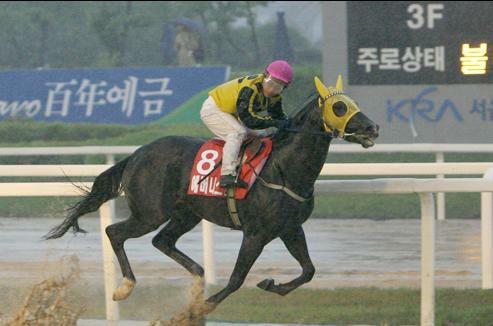 Back on an appropriately stormy day in Seoul in May 2008, Ebony Storm (Buster’s Daydream) pulled off a shock win in the Korean Derby when starting as the longest shot on the board. He did nothing in the remaining leg of the Triple Crown and, at 4-years-old, found himself gelded. He then embarked on a Class 1 handicap campaign that has continued to this day, regularly finishing in the money and occasionally winning. Today, on his 50th career start, Ebony Storm was sent off as a 33/1 outsider for Busan’s 7-furlong feature race. Steadily making-up ground the entire race, the 8-year old passed favourite All Su (Perfect Vision II) in the final furlong to record his 11th victory by just over a length. Up at Seoul, we had to wait until the very final race of the weekend to see Jiegum I Sungan (Ingrandire), winner of the 2012 Derby, do his thing. The 4-year-old still looks to have his best days ahead of him and he was in good form as he casually dismissed his rivals by 6 lengths over 9 and a half furlongs. The President’s Cup – and possible Grand Prix Stakes – will be Jigeum I Sungan’s target this year as he seeks to supplant Dangdae Bulpae as Korea’s top domestic-bred horse. Ebony Storm won’t be in either of those races, however, not many horses in Korea have won class 1 races in 5 consecutive years. If Jigeum I Sungan can emulate that one day, he will be a truly special horse. Also impressing at Busan today was US 3-year old Yeonggwanguijehyun (Rockport Harbor). The colt cruised to an 8 length win over fellow highly rated import Bathsheba Park (Harlington) in the 9-furlong race 5. The win – his 6th from 9 starts – qualifies him for class 1 racing next time out. We’re just 2 weeks away from the first leg of the 2013 Korean Triple Crown and, while the contenders for the KRA Cup Mile will most likely have already made their final appearance before the big race, former Korean Derby winners are on show at both Busan and Seoul this weekend. Ebony Storm (Buster’s Daydream) was the longest shot on the board when he won the 2008 Derby. While he’d never win another Stakes race, he’s gone on to become a solid handicapper over the years and, now 8 years old, will make his 50th start in Busan’s feature race on Sunday. He’ll have his work cut out to win the 1400 metre contest but few would back against him getting in the money. One horse that will be favourite this weekend is 2012 Korean Derby and Minister’s Cup winner Jigeum I Sungan (Ingrandire) as he heads the field in Seoul’s Sunday feature, the Listed Sports Donga Cup. The double-Classic winner won’t have things all his own way against a line-up that includes competent performers such as Magnifique (Menifee) and Singgereounachim (Exploit) but should be seeing them off. With just over 2 weeks to go until the 1st leg of the 2013 Korean Triple Crown, 17 colts and 2 fillies remain among the entries for the KRA Cup Mile – the Korean 2000 Guineas – which will be run at Busan on Sunday April 7. Host track Busan proves 11 while 8 could potentially travel down from Seoul for the big race. A maximum of 16 will be permitted to start. None are unbeaten and it is a competitive looking crop. Aussie trainer Peter Wolsley has 2 possibles in the shape Amell’s Atom and Fantastic Jazz, a half-brother to 2008 Korean Derby winner Ebony Storm – a horse still going strong nearly 5 years after his surprise Classic win. Pureun Energy, one of the 2 fillies left in, won Busan’s Champion Juvenile crown while Breeders’ Cup winner and overall national Juvenile Champion Yapung is also expected to start. On the breeding side of things, reigning Champion Sire Menifee accounts for 6 of the entries while Forest Camp and the late Pico Central are also likely to be well-represented. Narazaki Kosuke has returned to Japan. The 31-year old jockey had his last rides in Korea over the weekend, finishing 2nd on his final mount in Sunday’s feature race at Busan. Kosuke is returning in order to ride at the final meeting of his former home track of Fujiyama in Hiroshima which is closing. Kosuke will then relocate full-time to Ohi Racecourse in Tokyo. During his just over one year at Busan, Kosuke rode 68 winners from 505 rides and had a quinella strike-rate of 25%. He finished 5th in the Busan Jockey Championship last year and was lying in 2nd this. Although he didn’t win any Stakes races, he did partner Nobel Pokpung to 2nd place in the 2012 Korean Derby at Seoul Race Park and won numerous class 1 events at Busan. Among foreign jockeys, only his fellow Japanese rider Toshio Uchida and Australian Gary Baker have ridden more winners in Korea. Kosuke’s departure leaves Joe Fujii and Darryll Holland as the only 2 foreign jockeys at Busan although another newcomer is expected to start from April. 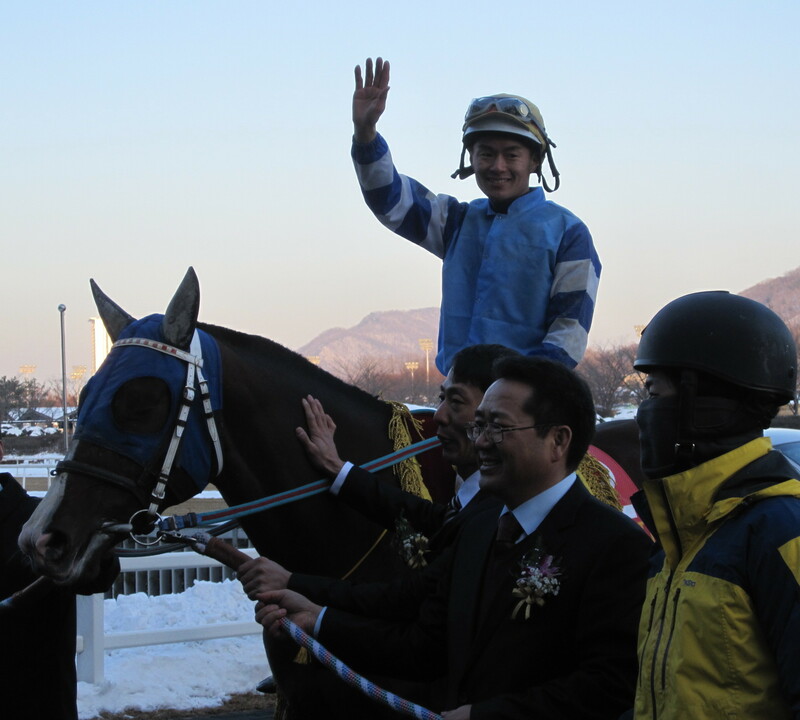 Yukio Abe remains the only foreign jockey at Seoul although a license has been issued for another to start soon. Useung Touch struck the first blow in the race to become Champion filly & mare of 2013 by cruising to a remarkable 7-length victory in the Ttukseom Cup, the first leg of the 2013 Queens’ Tour, at Seoul Race Park Sunday. Now 5-years-old, the 2011 Korean Oaks winner Useung Touch (Menifee)announced her return to form with shock 2nd place finish to Gamdounguibada in the Grand Prix Stakes in December. Today, re-united with jockey Choi Si Dae for the first time since she was a 3-year-old and dropping down to 7 furlongs, she was sent off as second-favourite behind Segye Ilbo Cup winner Indian Blue. Always travelling well, Useung Touch hit the front with just over a furlong to run and powered away from the field, still stretching her lead on the line. Fellow Korean bred filly Grand Teukgeup (Menifee), 3rd in last year’s Oaks was closest to her in 2nd, while Indian Blue’s effort was too little and far too late as she finished in 3rd. 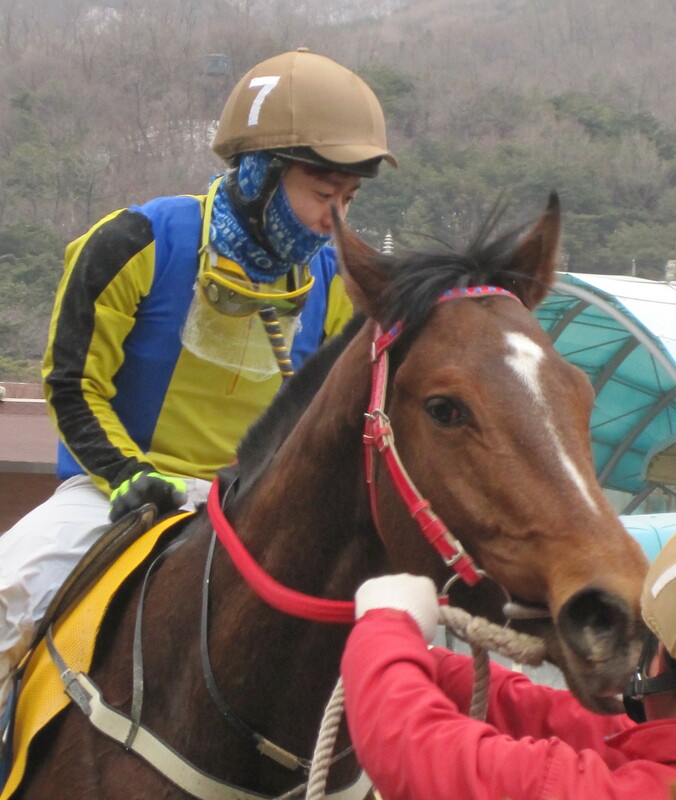 Useung Touch now has 7 wins from her 21 starts with 7 2nd place finishes and prize money of over 1 Billion Korean Won. A star of the 2011 Triple Crown trail, in addition to winning the Oaks, she was 2nd in the Derby and Minister’s Cup. While she only recorded one win in 2012, she’s now firmly established back among the Korean racing elite. 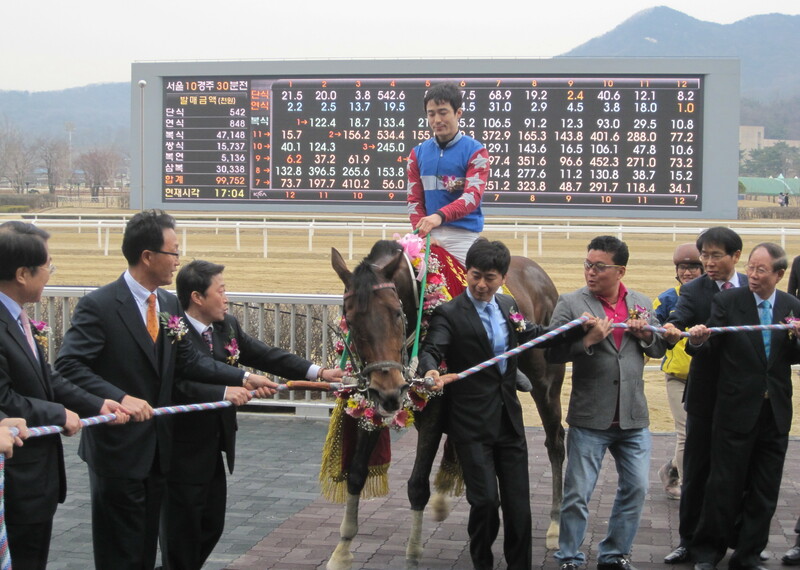 It’s another triumph for Korea’s top stallion Menifee. In siring the 1st and 2nd home, he extends his lead at the top of the Leading Sire race with more than double the prize money of his closest rival. * There is Listed race action at Seoul next weekend. 2012 Korean Derby winner Jigeum I Sungan (Ingrandire) heads the entrants for the Sports Donga Cup.